I think the best way to handle this situation would be to replace the outlet that was on a direct line to a GFCI on that direct line. For the light and fan that you are replacing, I would just install a GFCI circuit breaker. That way you would not have to reconfigure any of the wires. Looking at you picture makes me think that this box could use some professional attention. First of all, the grounds are spliced outside of the electric box. That is a big NO NO! Secondly, some of those wires seem really tightly pulled. A metal box like that heats up and cools down over the years, and wires that tight can have the insulation cut and short out. Now I can see it first hand but I would like to make sure you're safe. Thanks alot Bill. I will put the grounds inside the box and I have more wire. I determined that I cannot have a two switch setup to run the fan/light seperately because I only have a three wire setup for the original switch and the fan manufacturer says you can't configure it that way. So I'm going to wire the fan/light to operate at the same time. My main concern (once I bring the grounds inside and clean the box up and make it nice and tight) is the neutral wire from the center switch. I've looked at books and pictures and I don't see where you would leave the neutral just hanging in the box. Everything is working and no lights are out in the kitchen so I'm assuming the switch being wired with the red and black wires from that wire bundle don't need the neutral to complete the circuit. I just feel unnerved because the neutral is just going to sit in the box. All the other neutrals are wire nutted together. Thanks for the prompt response. If it weren't for unemployment I'd hire an electrician to run more wiring and make the fan operate seperately from the light. Without being there with a tester, I can't tell what the neutral is for. 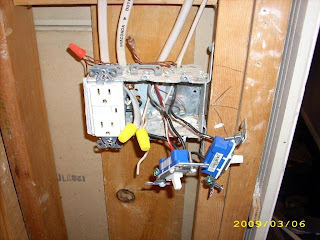 I can say that you may have an extra when you are changing the wiring around.